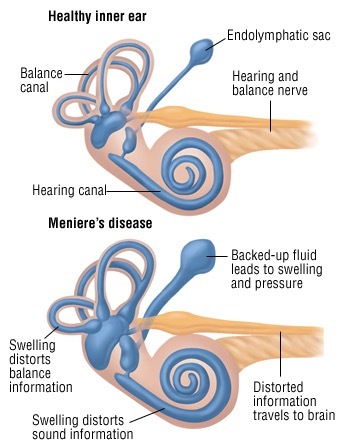 Ménières disease describes a set of episodic symptoms including vertigo (attacks of a spinning sensation), hearing loss, tinnitus (a roaring, buzzing, or ringing sound in the ear), and a sensation of fullness in the affected ear. Episodes typically last from 20 minutes up to 4 hours. Hearing loss is often intermittent, occurring mainly at the time of the attacks of vertigo. Loud sounds may seem distorted and cause discomfort. Usually, the hearing loss involves mainly the lower pitches, but over time this often affects tones of all pitches. After months or years of the disease, hearing loss often becomes permanent. Tinnitus and fullness of the ear may come and go with changes in hearing, occur during or just before attacks, or be constant. 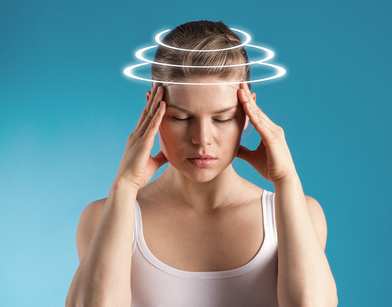 Ménières disease is also called idiopathic endolymphatic hydrops and is one of the most common causes of dizziness originating in the inner ear. In most cases only one ear is involved, but both ears may be affected in about 15 percent of patients. Ménières disease typically starts between the ages of 20 and 50 years. Men and women are affected in equal numbers. Because Ménières disease affects each person differently, your doctor will suggest strategies to help reduce your symptoms and will help you choose the treatment that is best for you. Although the cause is unknown, Menieres disease probably results from an abnormality in the volume of fluid in the inner ear. Too much fluid may accumulate either due to excess production or inadequate absorption. In some individuals, especially those with involvement of both ears, allergies or autoimmune disorders may play a role in producing Ménières disease. In some cases, other conditions may cause symptoms similar to those of Ménières disease. People with Ménières disease have a sick inner ear and are more sensitive to factors, such as fatigue and stress, that may influence the frequency of attacks. An audiometric examination (hearing test) typically indicates a sensory type of hearing loss in the affected ear. Speech discrimination (the patients ability to distinguish between words like sit and fit) is often diminished in the affected ear. Electrocochleography (ECoG) may indicate increased inner ear fluid pressure in some cases of Ménières disease. The auditory brain stem response (ABR), a computerized test of the hearing nerves and brain pathways, computed tomography (CT), or magnetic resonance imaging (MRI) may be needed to rule out a tumor occurring on the hearing and balance nerve. Such tumors are rare, but they can cause symptoms similar to Ménières disease. Intratympanic injections involve injecting medication through the eardrum into the middle ear space where the ear bones reside. This treatment is done in the otolaryngologists office. The treatment includes either making a temporary opening in the eardrum or placing a tube in the eardrum. The drug may be administered once or several times. Medication injected may include gentamicin or corticosteroids. Gentamicin alleviates dizziness but also carries the possibility of increased hearing loss in the treated ear that may occur in some individuals. Corticosteroids do not cause worsening of hearing loss, but are less effective in alleviating the major dizzy spells. An air pressure pulse generatoris another option. This device is a mechanical pump that is applied to the persons ear canal for five minutes three times a day. A ventilating tube must be first inserted through the eardrum to allow the pressure produced by the air pressure pulse generator to be transmitted across the round window membrane and change the pressure in the inner ear. The success rate of this device has been variable. Labryrinthectomy and eighth nerve section are procedures in which the balance and hearing mechanism in the inner ear are destroyed on one side. This is considered when the patient with Ménières disease has poor hearing in the affected ear. Labryrinthectomy and eighth nerve section result in the highest rates for control of vertigo attacks. Copyright © 2014 American Academy of Otolaryngology–Head and Neck Surgery. Reprinted with permission.